Significant financial crime often happens online today, but check fraud is still a very real and very dangerous phenomenon. From stolen checks to forged accounts, criminals use paper checks to obtain money and empty accounts before the account holders and banks know what happened. Know what check fraud looks like to protect yourself against it. Your routing number and account number are printed on every check you write. That plus your name and address (which also appears on your checks) is enough to buy goods on many websites. All someone needs is one of your checks, which you may write to them to pay for a good or a service, and they have that sensitive information. Always verify that a business is reputable before writing them a check. Some criminals will steal checks from a business and use high-end copy machines or printers to recreate the checks. Then, they write checks to themselves or to their partners from your account and withdraw the money before you realize anything happened. You can protect yourself by getting heat-sensitive and watermarked voucher checks that protect you against this kind of forgery. With your routing number, account number, and a bit more information, a thief can hijack your checking account. The thief changes your address. Then, that criminal will empty your bank account by writing checks to the new mailing address. Either mail your checks in a secure way or deliver them in person to avoid this. Check kiting has been around for some time and takes advantage of bank delays in vetting checks. A criminal will open two checking accounts and write a check for a small amount for the first account. That criminal then writes a check for a larger amount of money and deposits it into the second checking account. Before the check can bounce, the criminal withdraws that second check as cash. Even modern banks have deposit delays that facilitate kiting, though it’s more difficult than it used to be. 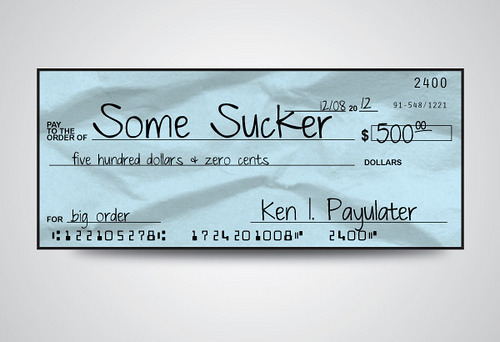 Only accept checks from people you know and trust to avoid being paid with a bad check that’s part of a kiting scheme. Some criminals create fake online jobs to lure people into giving away account information. In this instance, the fake job will try to get your financial information, often by sending you a paycheck or sign-up bonus before you’ve done work. They’ll have you deposit the fake check and send some portion of it back to them. Others simply ask for your financial information so they can wire your paychecks to you. Always do your research before accepting an online job offer, especially one that offers money before you’ve done anything. Be careful with your paper checks. Use checks with forgery and washing protections built-in, keep track of every check you write, and monitor your checking account diligently. Avoid writing a check to a suspicious individual or company, and contact your bank immediately if you suspect problems.